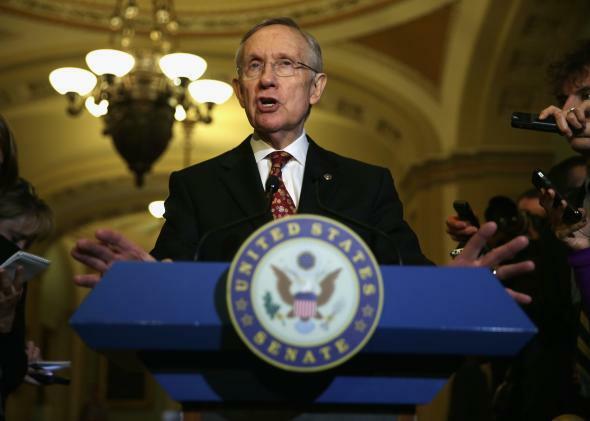 Nuclear option: Filibuster reform passes. Wait, What Just Happened in the Senate? He’s having a good day. Majority Leader Harry Reid’s “nuclear option” has passed, meaning Republicans will no longer be able to filibuster executive and judicial nominees. From now on, nominees will only need a simple majority, aka 51 votes, to be confirmed. Supreme Court nominees can still be filibustered. From inaction for more than a year and the filibustering of four of five nominees to the D.C. Circuit Court, the entire discourse was turned around in the span of an hour. Heritage Action quickly “key-voted” the measure, meaning any Republican dumb enough to vote “no” would incur the wrath of the conservative PAC. The final vote was 48 ayes, 52 nays (confusingly, a “no” vote meant “yes” for dismantling the filibuster). Reid left the juicy 51st vote for himself. The D.C. Circuit Court of Appeals has outsize influence reviewing many of the cases involving federal administrative agencies, and four of the nine Supreme Court Justices have served on the court. The eight active judges on the court are split evenly by party ideology, although Republicans appointed five of six senior status judges, who sometimes hear cases. The only reason it was called the “nuclear option,” as far as I can tell, was to trick readers into clicking on stories about procedural rules. Hopefully now news outlets can stop calling this the “nuclear option” and just say “filibuster reform” like normal humans.